Iron Forge Cables' 6 Ft Extension Cord is the perfect power cable for all your home electrical needs. It offers heavy duty strain relief for optimal performance, and a 3 prong grounded molded male plug for added safety. The cord's 6 foot length gives good reach across most rooms. ETL and CETL Listed. Whether you want to power your TV, game console, computer, lamp, blender, toaster, microwave, Christmas decorations, vacuum, or other appliances, this high quality extension cord is designed to meet all your needs and hold up well. It's both water resistant and flame retardant. The vinyl covering protects the cable against abrasion and direct sunlight. 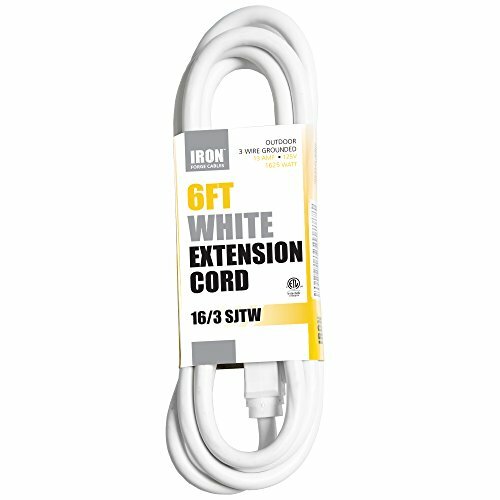 And the extension cord's white color is easy to see for extra safety.